Have you ever seen a furry end table in Kenosha, WI? I’m talking about a dog or cat that is so fat that their back is flat. You really could set a coffee cup on their back and have no fear that it would fall off…at least if they didn’t walk. And if we are really honest, what they do is not considered walking, but waddling. As a veterinarian, I have. I once saw a 29.6 pound cat. I’ve seen dogs that are 120 pounds, but should have weighed 75 pounds. I used to laugh at it, but that wasn’t right (now, for those of you who know me, I was the child laughing at the nun after she got hit in the head with a Frisbee…maybe it’s inappropriate laughter). Then, I used to take the stance that I should be angry and lecture the owner. Now, with age, experience, or whatever else you want to call it, I just feel sorry. I feel sorry because their pet isn’t living. I feel sorry because the human families don’t get to enjoy their dog or cat the way I have gotten to enjoy mine. But most of all, I feel sorry that no veterinarian has shown them the way out. How do you properly feed your pet? There are many different ways to tell if your dog or cat is overweight. Hill’s, who makes Science Diet (a great food and company), has a very complicated measuring system – I recommend that you leave this to the veterinarians. However, Purina makes a good 9 point system for dogs and cats called the body condition score. The ideal score is 5. Any score greater than 5 is overweight. Any score less than 5 is underweight. I strongly recommend using the chart to help you. Ducks waddle, but no other animal should. 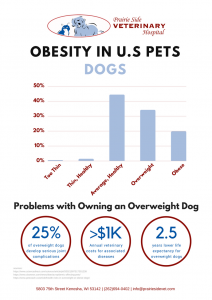 Most of our pets are overweight. If you live in Kenosha, Racine, or Franksville, let’s just pull the band-aid off now and tell it like it is. They are overweight. Many of them are fat or obese. It doesn’t matter. Today is when we start to recognize it for what it is. Today is the day we start to get our pets back and living again. Follow my next few blogs at Prairie Side Veterinary Hospital and see if we can’t take back our pet’s lives.